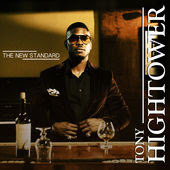 Tony Hightower "The New Standard"
Tucked away adjacent to the Freedom Parkway in the Old Fourth Ward in Downtown Atlanta is a recording studio that occasionally doubles as an intimate performance space. It is called 800 East Studios and on Wednesday night it was the scene of a performance by Atlanta’s own Tony Hightower. 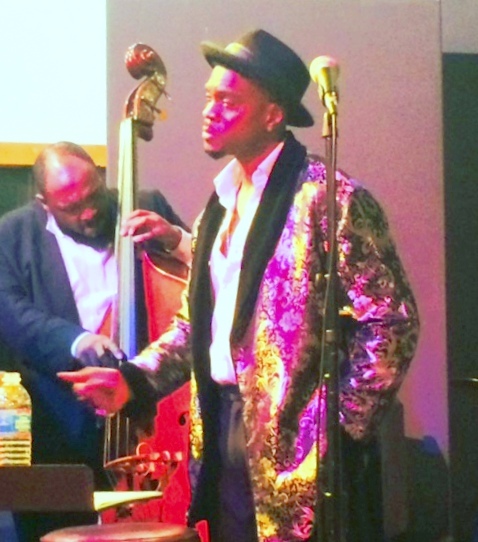 Mr. Hightower is a vocalist whose sound is an amalgam of Marvin Gaye, Smokey Robinson and Nat King Cole. It was a coming out of sort, billed as re-release of his latest album “The New Standard.” He was backed by pianist Kenny Banks,Jr., bassist Kevin Smith and drummer Henry Coneway III, collectively known as the HC3 trio. The evening, scheduled to start at 8pm didn’t kick off till closer to 9. I was fortunate enough to get a front row seat and had the pleasure of sitting next Mr. Hightower’s Grandmother Martha, who was an absolute delight and an unequivocal fan of her grandson, as is to be expected. Talking with her, I found out that Tony started out playing the drums, but always had a penchant for singing a tune. There is no doubt Mr. Hightower has music in his DNA. His mother, Teresa Hightower, is a well know vocalist on the Atlanta music scene. A working musician herself, she had a standing gig at the Ritz Carlton in Buckhead for an amazing nineteen years, among her other musical credentials. Tony found a mentor in the brother of his musical idol, Nat King Cole. Freddie Cole, the brother of the great crooner/pianist and a fine singer in his own right has been a guiding light , encouraging Hightower to pursue his career in jazz . The evening started with the HC3 trio playing a fine rendition of “Dolphin Dance.” Mr. Banks demonstrated some elegance on the Yamaha grand, Mr. Smith produced large, plump notes from his upright bass and. Mr. Coneway kept the music swinging. Mr. Hightower came into the room wearing stylish sunglasses, in a gold lame smoking jacket, with brushed velvet loafers, an upturned pork pie hat and a large diamond stud in his right earlobe. In the current vernacular he was “fresh.”Part of Mr. Hightower’s mantra is to try to bring back the style and grace of the former performers like Sinatra and Cole, and so his dress and demeanor all play to that theme. The opening song was one of Mr. Hightower’s originals, “All Belong to You.” He sang this with an almost uncanny resemblance to Nat Cole’s voice. Mr. Hightower delivered the silky lyrics to perfection and you felt like you were temporarily transported back to a night club in the nineteen-fifties.. The evening featured standards like “Kiss Me Baby,” “Gee Baby a’int I Good to You,” and a Cole-like version of “Nature Boy.” The most poignant song of the evening was Mr. Hightower’s “ Plain Jane,” a song that laments about having a career that never quite makes it to the front row. The lyrics ache with the emotional angst of being teased with success only to have it suddenly removed. Perhaps the most jazz-like song of the performance was a deft handling of Thelonious Monk’s “I Mean You.” You could see this was a vehicle for the band to stretch out a bit from the confines of the repertoire and Banks, Smith and Coneway had fun with this one. The song t also allowed Mr. Hightower’s to use his voice as the instrument it is. There is no denying the R and B in him, ala Smokey/Marvin, and he has great control of the falsetto aspects of his voice, but judicious use of this facility would be highly recommended if he wants true jazz cred. I particularly found his Carpenter inspired version of the Bacharach song “:Close to You” painfully dragged out.. I was never a fan of this syrupy concoction and I am one that believes this song would be better left unearthed from the crypt from where it came. Mr. Hightower has style and his voice is quite beguiling when he settles it in the middle register and his talent should not to be underestimated. He is on a quest to bring sophistication and savoir-fare back to the music and on many levels he is accomplishing just that; bridging the gap between soulful R and;B and Jazz in a way that few people are doing today successfully. My hat is off to him and I anxiously wait to hear where he takes it from here.